Home health aides and personal care aides make a major difference in the lives of their clients— providing essential health care that their families may not be able to offer. 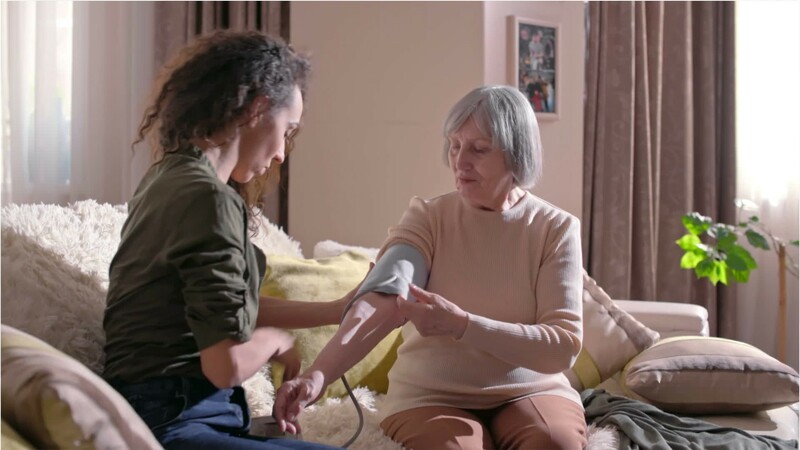 Home health aides help the elderly… people with disabilities… and those recovering from illness… with basic healthcare tasks such as changing dressings and administering medications. They monitor their clients’ health and report changes in status to licensed nursing staff, who direct their work. Personal care aides —sometimes called caregivers or personal attendants— generally provide only non-medical services, including companionship, cleaning, cooking, and driving. Their clients may be elderly, or have developmental or intellectual disabilities. Both personal care aides and home health aides may help with routine tasks like feeding, bathing, and dressing. Most aides work in clients’ homes, but they may also work in group homes, hospice care, and adult daycare facilities. Some see the same client daily for years, while others work with new clients often. Full-time work is common but many aides work part time… their schedules generally depend on clients’ needs. Most aides have a high school diploma, although not all positions require it. Jobs in certified home health or hospice agencies require formal training and certification. Some states require additional certification. While these careers can be emotionally and physically demanding —clients… and their families… rely on the skills and integrity of home health and personal care aides. See more details at O*NET OnLine about personal care aides. Personal Care Aides by U.S. Department of Labor, Employment and Training Administration is licensed under a Creative Commons Attribution 4.0 International License.